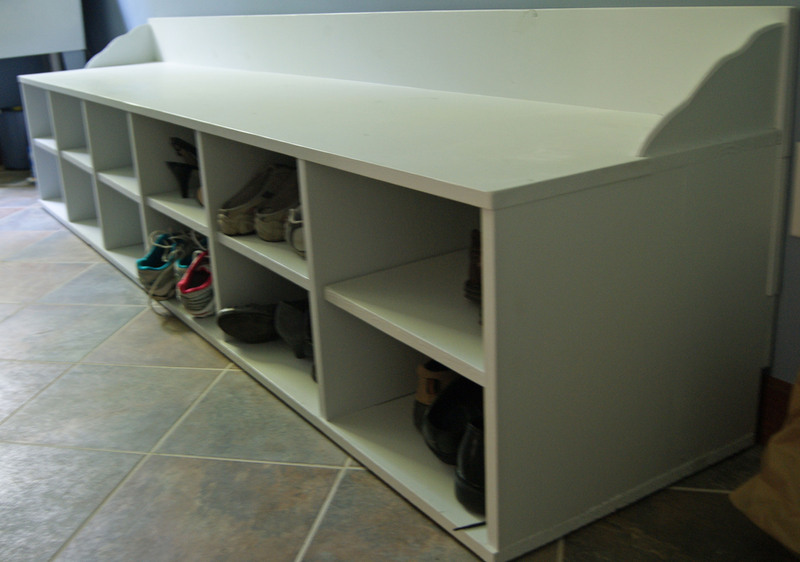 The shelves and bench ended up being pretty big (like, eight feet big), which is typical of one of my projects. Go big or don’t bother. The room is fairly long, so there was space, and the boards all came in standard eight-foot lengths, so why make an extra cut if you don’t absolutely need to? I was originally thinking something more like six feet, but tossed that idea out very quickly. Besides, now instead of a flat wall, we have a potential eighty-two cubic feet of storage space, most of which we will probably manage to fill in the next three weeks. I started construction by selecting and then gluing boards together. I spent, easily, a couple hours going through lumber, looking for straight, even, unwarped boards, or at least as close to that as I could get. The downfall with using eight-foot lengths is that it’s probably just about impossible to find a perfect board that size, let alone a dozen. But I got as close as I could, and it adds to the rustic appeal, right? The bench part consisted of two 8 x 10’s glued together for both the top and bottom and two 8 x 10’s for the divider (this will be cut to fit later). For the supports, I glued two 6 x 10’s together and just cut one side down to fit – this was entirely a cost-cutting measure; it was cheaper and produced less waste than buying 8 x 10’s, though required a little more work (if you don’t care about cost, just use 8 x 10’s for the supports and you won’t have to worry about making any cuts). Finally, for the back, glue the 8 x 8’s together (and, though I didn’t know it at the time, tack on one of the 8 x 4’s as well – when it was all put together, the top was a little low for my liking, so I added one 8 x 4). The only gluing needed for the upper shelves was for the back – two 8 x 10’s and the other 8 x 4. Once the glue is dry (in my case, the glue dried for about a month), begin assembly. The bench consists of the top (8 x 20″ total) and bottom (8 x 20″) and the supports. Cut the supports into 16″ lengths; you’ll need seven total. Starting from either end and working inward, attach the bench top to each support piece using a couple screws (note: I put the supports one every 15 1/8″ – be careful to include the width of the wood in your measurements!). 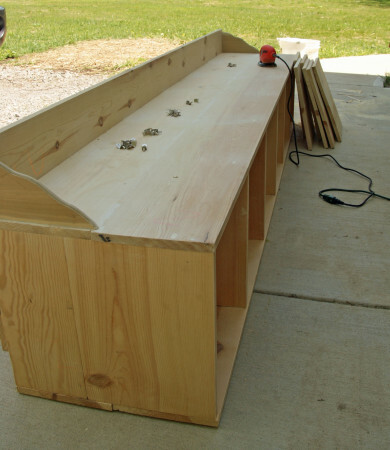 Flip and repeat the process with the bench bottom. You should now have a top and bottom split into six (hopefully) even compartments. Lay the entire assembly flat on its front, and screw the bench back onto the main bench assembly. 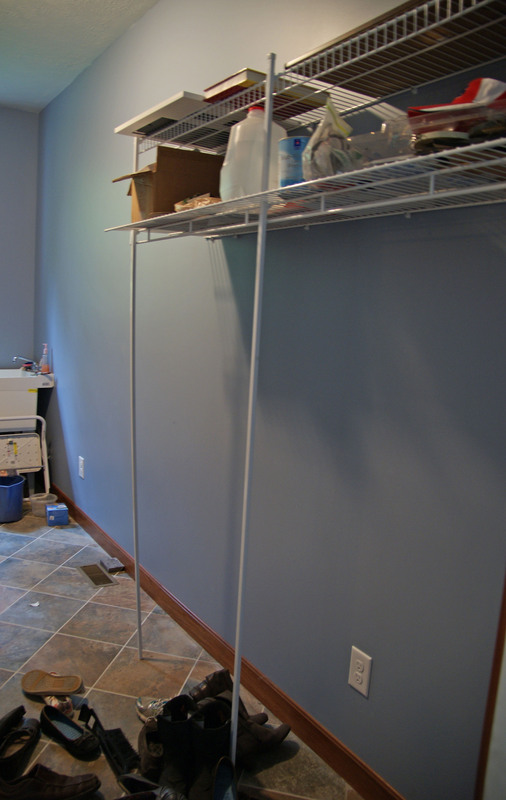 Because I wanted the bench flush against the wall, I started the back 4″ off the ground to account for the baseboard. 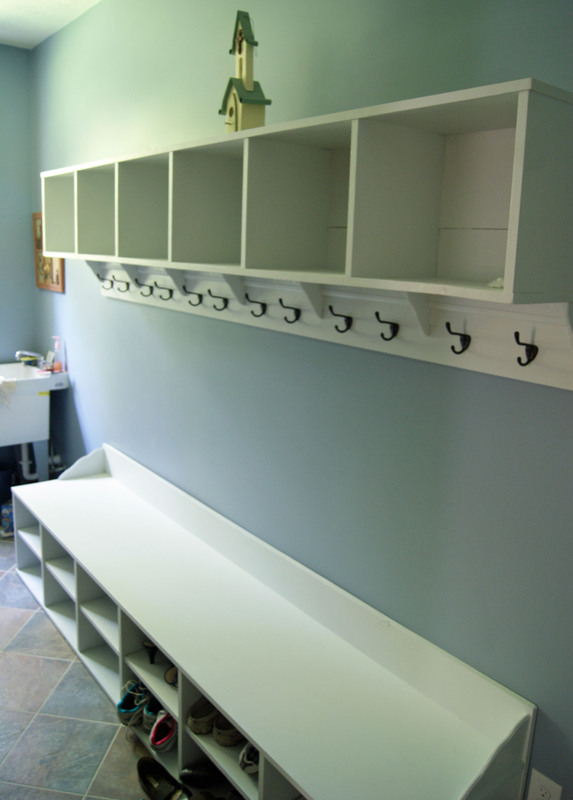 The back should extend approximately 6″ above the bench top. The upper shelves consist of a top (one of the 8 x 12’s), a bottom (another of the 8 x 12’s), the supports (the other two 8 x 12’s cut into about 16″ pieces; again, you’ll need seven total), and the back. Similar to the bench, attach the top to the supports, flip and attach the bottom, then flip and attach the back. The back will be even with the top, and extends about 6″ below the bottom. 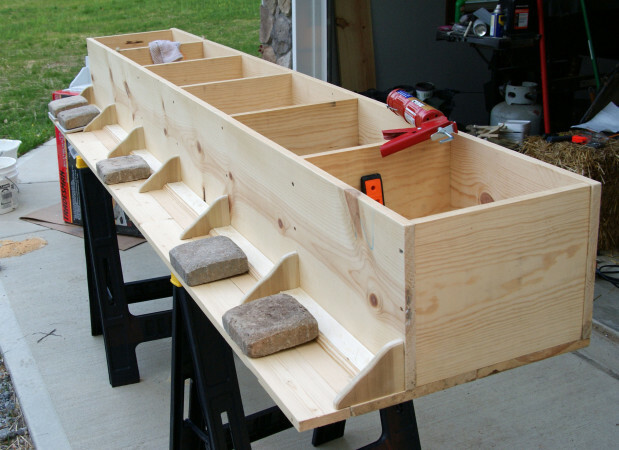 To create the dividers for the bench, take the final 8 x 20″ piece and cut into 15 1/8″ sections (six total). Drill four 1/4″ holes (two per side, about 8″ from the bottom) into each side of the lower boxes – this is where you’ll put the shelf brackets. Definitely make sure your marks are level before you drill these holes, otherwise your shelves could end up tilting – not ideal. The maxim “measure twice, cut once” applies to drilling too. For the finishing touches, I cut one of the poplar pieces into about 3″ sections (seven total) and traced what was basically a right triangle with a wavy hypotenuse (don’t remember what a hypotenuse is? I’m not going to tell, you have to look it up), and then cut each one out with the jigsaw. I also routered a little bit of a fancier edge on them, but that’s not required. I then glued each one of these on the upper shelves in line with each support board. It serves no functional purpose, but does visually divide the upper part and just looks nice. 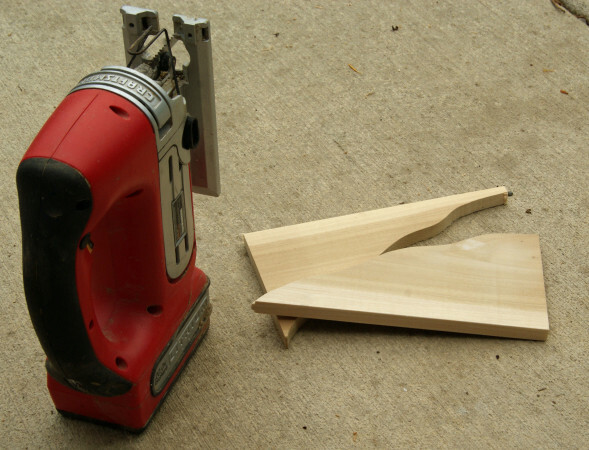 I did the same thing with the other poplar piece, though cutting this one into two 12″ pieces, and just making that wavy hypotenuse a little longer. These two go on the sides of the bench. 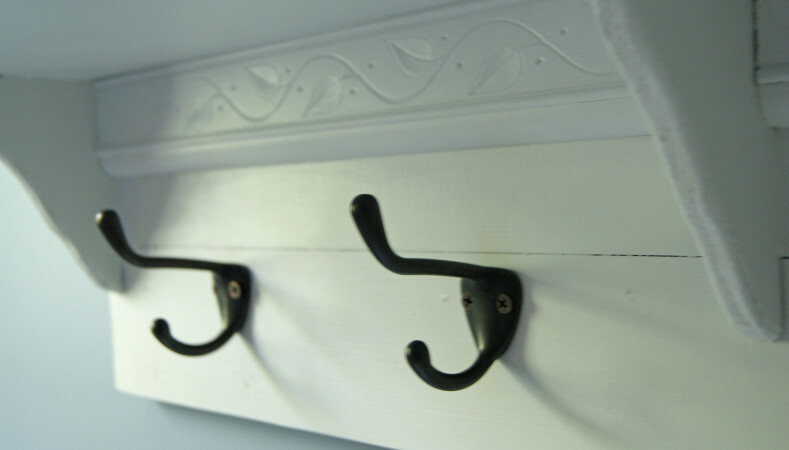 And finally, for the totally unnecessary, cutesy part (that was all S’s idea), cut the deco trim, the flat trim, and the quarter-round into six even pieces, about 15 1/8″ long. 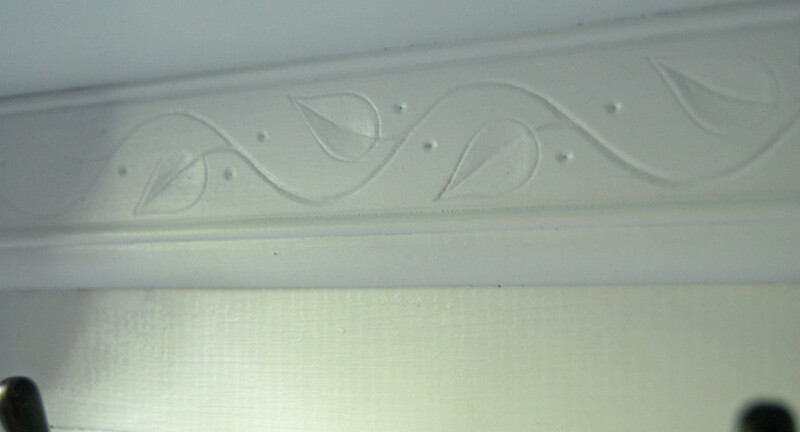 In between each of the upper dividers, glue the flat trim, then the deco trim on top of that, then the quarter-round below the two. Again, no functional purpose, but I will admit, it does add character 🙂 When it’s all fully assembled, paint it! I did two coats in an eggshell finish. And, of course, getting them mounted. The lower part was easy – it’s actually not even attached to anything, just floating. I did put a couple of those felt furniture pads on the bottom to get it off the ground just a little. Attaching the upper shelf requires at least a couple people, unless you’re Superman or can make objects levitate by looking at them. In which case, leave me your name and number. With one person holding up each end, drill some pilot holes (make sure you find the studs!!! ), and when you’re satisfied that everything is level, go ahead and put in the wood screws. We used six – I’m not sure what the weight-bearing capacity of each screw/stud is, but the thing probably weighed close to 100 lbs unloaded, and who knows how much junk will end up in the cubbies, so I tried to err on the side of overdoing it. And now you have a nice new set of shelves. Feel free to ask any questions. I think I covered everything, but certainly may have left something out. I’m by no means a carpenter, but they turned out pretty nice, I think. Another view of an individual section (upper). Lower shelves, installed. 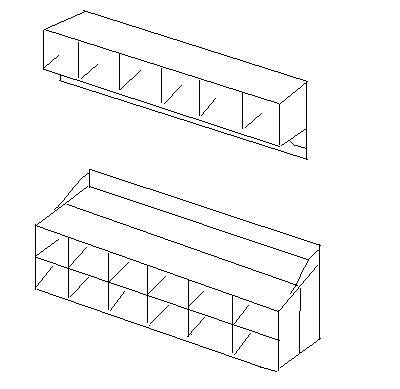 The middle shelf is removable. Also note the bottom right, where the back piece ends above the floor to leave room for the baseboard.